The Reversing Falls under the bridge which crosses the Saint John River in New Brunswick, Canada is amazing to watch when the tide changes. A narrow bridge spans the Saint John River in New Brunswick, Canada where the tides create whirlpools and rapids which have been named the Reversing Falls. To watch this act of nature take over the waterways is fascinating, especially at low tide when the river empties into the bay over a ledge 36 feet below the surface. The water whips around as the tide rises and for a short time period of about 20 minutes, boats and other water vessels can make their way through the Reversing Falls. The tide continues to come in and raise the height of the Saint John River until the currents become reversed and it reaches its greatest depth and once again, it will recede. Another time span makes it possible to cross under the bridge and then the entire process is repeated. 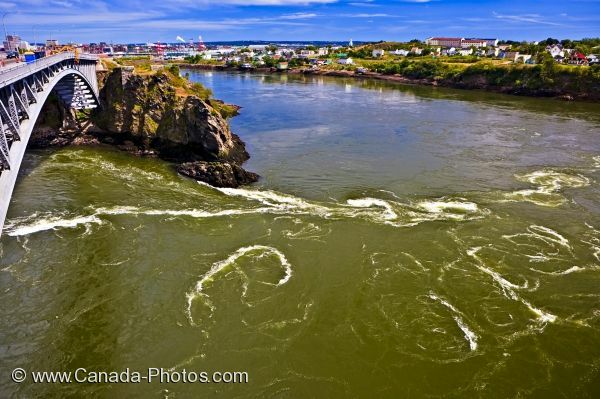 Photo of the swirling water of the Reversing Falls in the Saint John River in New Brunswick, Canada.